And this is the beginning of my failure to keep up to my 30 Days Challenge! I have skipped the entry for my 7th day on the 1st of February and thus I have to put it together with my Day 8 entry! This is agonizing, especially given that I have tried for *nearly* a week to piece it together that I can do it. Would that actually mean I am a person with minimal determination to complete something? That really gives me a food for thought. Whatever it is, I hope that this return gives me a reason to remember that I will always have to keep up to what I have promised whether or not anyone cares. I absolutely LOVE this; a lot and much more than the original Lion King. I'm sorry to Lion King lovers but somehow I didn't find much love in the fact that Mufasa had to die and then later on Scar. 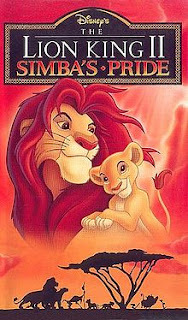 The hyenas were quite a laugh but it just couldn't beat how The Lion King II: Simba's Pride caught my eye instead. From the music to the way that the movie flowed, there was somehow something that made me...enjoy it without skipping away certain scenes and even when my family only has it on the old school VCD, I really don't mind having to go ahead and change discs mid-way. So yeah, there we go on my favourite movie...except it's not really a movie and I'm breaking rules. Well, I already did when I skipped Day 7, no? And heading of, my Day 8 entry. It says to talk about "What I want to be when I grow up" and I suppose most of my close friends already have the answer to this. I'll be honest, I have told almost all my friends... *almost* being a good keyword, that I have always, ALWAYS in this whole life of mine wanted to be nothing but an air-stewardess. For a while, I did switch to thinking I could possibly be an authoress and be J.K. Rowling ala Asian or something but then I realized that I have never stopped thinking of my dream whereby I could fly and see the world while meeting new people and learning new cultures every single time I board that plane. What I have in my pig's sty room; somehow to remind myself this is what lies ahead. Personal details removed for privacy purposes. 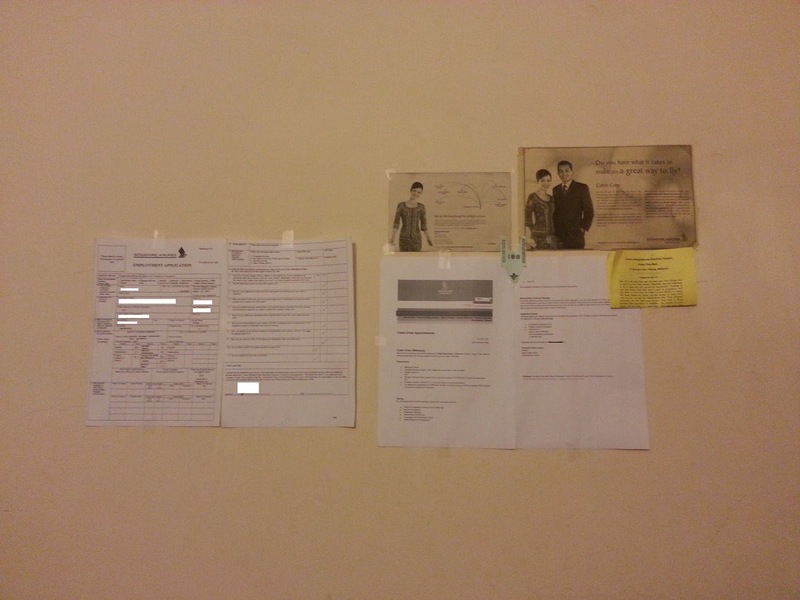 In fact, here's a part of my room to remind myself of what I am trying to achieve. Lots of people have asked if I were tall enough to achieve such a high dream and I would always snap back that I am just right for it. Well, for Singapore Airlines, Malaysian Airlines and Cathay Pacific Airways maybe. Then again, I have completely omitted myself from joining MH, leaving only SQ and CX in my mind. Of course, there are days where I would be thinking about how I could possibly leave my parents, family, loved one and friends back here while I go ahead and seek my own adventure but then I realized that if they are meant to be in my life, it didn't matter where I was; they would still be in my life, my heart and probably, my own home in the future. So there we have it. Two days in one post simply because I missed out on one day of this 30 Days Challenge that I have inflicted upon myself. Here's to another...22 days before I stop traumatizing telling you stories about myself. Cheerio!